Banksy Does New York streaming: where to watch online? On October 1, 2013, the elusive street artist Banksy launched a month-long residency in New York, an art show he called Better Out Than In. As one new work of art was presented each day in a secret location, a group of fans, called “Banksy Hunters,” took to the streets and blew up social media. Currently you are able to watch "Banksy Does New York" streaming on HBO Now, HBO Go. 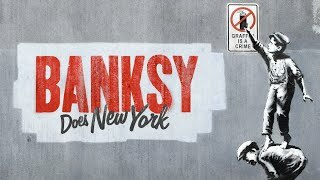 It is also possible to buy "Banksy Does New York" on PlayStation, Google Play Movies, Apple iTunes, Vudu, YouTube as download or rent it on PlayStation, Apple iTunes, Vudu online.